Daily Illuminator: All Roads Lead To Rome . . . Or Mayhem! September 3, 2012: All Roads Lead To Rome . . . Or Mayhem! If you're wondering what the Romans have done for us -- besides sanitation, medicine, roads, public order, etc. -- then you need to check out GURPS Classic: Imperial Rome, newly released to e23. It provides extensive information on an amazing civilization, including its history, geography, people, locales, religion, and more. It offers details on how to run a Roman campaign, whether you're racing your chariot around the Circus Maximus, currying favor among senators on the floor of the Forum, or fighting Roman gangs in the streets or pirates on the seas. 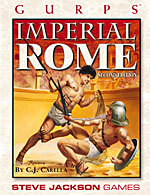 Although this supplement was designed for GURPS Third Edition, it still contains invaluable information useful in many Fourth Edition campaigns, such as GURPS Martial Arts: Gladiators and the recently released GURPS Hot Spots: Constantinople, 527-1204 A.D. (not to mention Roman-centric articles in recent issues of Pyramid magazine . . .). Noted orators agree: If you're taking to the famous streets of Rome, you need GURPS Classic: Imperial Rome! However, if you're taking to the streets for a different kind of excitement, we humbly suggest the fast-paced fun of another Car Wars quick-start kit. 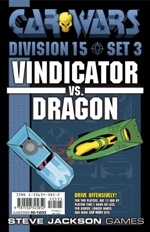 This time we're pleased to announce that Car Wars Division 15 Set 3 - Vindicator vs. Dragon is newly arrived at the e23 garage. In addition to the rules and counters you need, it also includes two Division 15 cars, ready to fight each other! The Vindicator has heavy armor and versatile weapons, while the Dragon lives up to its name with twin front-mounted flamethrowers and a few other surprises in its "tail." It's dangerous to travel the mean streets without protection . . . especially if you're one of the folks that's making the streets dangerous!